In a typically high-octane match, Benfica needed to go to extra-time and some poor goalkeeping from Sporting no. 1 Rui Patrício to progress after being in front up until the 93rd minute. Rather than looking at the game as a whole, the focus will fall upon specific tactical issues. In a match that confirmed Jorge Jesus' latest change of hearts as far as tactics go, Benfica appeared in 4x3x3 (even though Jesus himself denied it in a press conference earlier this week). The 4x3x3 formation now seems to be Benfica's default option against strong(er) teams, after being often overrun through the middle over the past years. Although the coach was always reluctant to adhere to a more conservative approach, both the match against Olympiacos and the match against Sporting offered a Benfica more capable of controlling proceedings. Jesus might have a point when he claims that this formation is not a 4x3x3 (at least, not the purest one). Gaitán, nominally deployed on the left wing, often drifts inside, while Markovic seems to have clear instructions to come to the centre whenever Cardozo gets the ball with his back to goal. 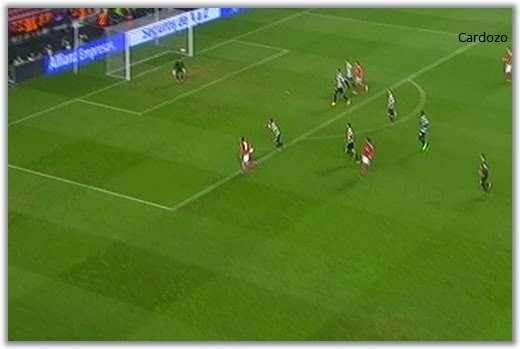 That move is further compensated by Enzo Pérez' lateral movement to the right, so as to stretch the play. All of this is capped off by Cardozo's impressive ability to offer the right passing option at the right time, allowing the team to progress while he holds the ball upfield. Without it, this particular game plan would be that much harder to implement successfully. However, it's Ruben Amorim that may be the most important clog as far as match control is concerned, by playing out the simple pass and always being present to make necessary the interception as soon as the teams gives the ball away. Arranged like this, Benfica look more the part of an organised, dominant side, rather than repeatedly betting on the "vertigem vertical" - literally vertical vertigo, as André Villas-Boas would put it. If you just kept your eyes on André Martins up until the moment he left the field, you would probably think that you were watching his game against FC Porto a few weeks ago - if it weren't for the red shirts, of course. Once again Sporting coach Leonardo Jardim insisted on deploying the young midfielder as a no.10 off Fredy Montero, rendering him virtually useless in a position where the player is not particular proficient. 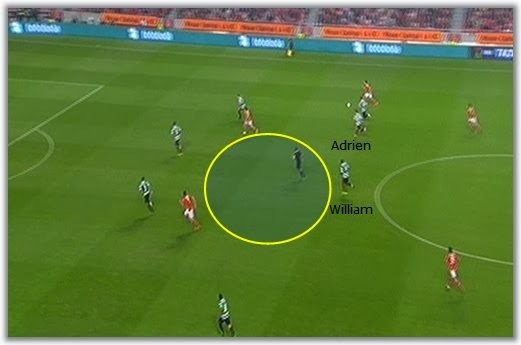 The carbon copy of his display went as far as repeating the timings of the changes: After a whole half of wandering somewhere upfield, it was when he dropped back and Adrien Silva finally broke the siamese pairing with William Carvalho - in the second half - that Sporting looked more dangerous. It should be clear by now that Martins is not the perfect fit for the rarefied environment in front of his opponent's penalty box, against centre-backs and holding midfielders. His game improves exponentially as soon as he has team-mates to combine plays with and is facing towards the other team's goal, and not the other way around. Given that Sporting are constantly being run over in the centre (much like their cross-town rivals were) against stronger teams such as FC Porto or Benfica, it might not be a bad idea to allow the 23-year-old back into the midfield fold - both for his sake and the team's. 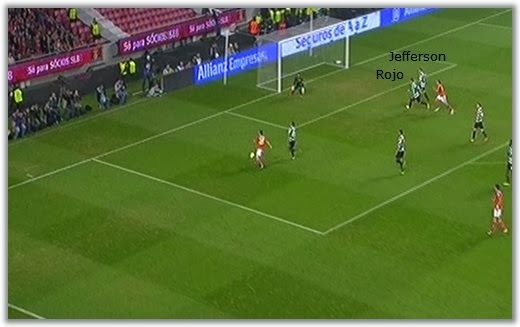 As it was, Sporting struggled to break through Benfica's defensive wall and to create any significant chances from open play for as long as Jardim insisted on his seemingly outdated system. Sporting have looked weak in the middle throughout the season. That much has been plain for everyone to see in several matches, and even more so at the team's first real test, at the Dragão a few weeks ago. That is indeed one of the reasons why the Lions always seem more at ease when they play away from home, where the opponents are a bit more open and willing to get a positive result other than a draw based on bus-parking and time-wasting. Last night's match offered yet again clear evidence that the team struggle to create opportunities from open play, particularly when Adrien is asked to help William Carvalho patrol the midfield area and André Martins is left ostracized up front. All of this means that the centre-backs (not the most technically gifted players to start with) often have to resort to long balls to the hard-working Montero, bypassing their own midfield altoghether. What's worse, this forces both midfield and defence to keep readjusting over and over again as soon as the team give the ball away - which usually doesn't take that long, since Montero hardly has any support near himself. Here Sporting once again found themselves trailing early on after some poor defending, found a way to level the score only to concede a second goal just moments later. The third goal would soon follow in both matches after a less than perfect transition into defence. Below you will find some images that may help understand where Sporting's biggest problem seems to lie, starting with the first goal. In a normal run of play, Sporting are already in a numbers-down situation. The circle represents the area of constant problems for Sporting. Markovic intelligently drags Rojo and Jefferson out of position. As above, even the referee seems to have a better understanding of the best positioning. one that Sporting keep neglecting. Notice Rojo's feet, still pointing the wrong way. but Maurício is also wandering elsewhere. The second goal was a little less obvious, but a more thorough analysis shows how far Sporting's defence (let's leave the central midfield area for a while) lags behind FC Porto or Benfica's, for instance. The initial deficient positioning stems from an aerial duel. Enzo Pérez wins the second ball back and Sporting immediately look unbalanced. while Jefferson and Rojo are both marking Markovic. Jefferson and Rojo's reference is the man, rather than the zone. with his simple yet intelligent movement. There's no attempt to control the space. and Cardozo has all the time he needs to pick his spot.